Aggressive financing programs helped dealers through the economic downturn, but customer retention was difficult to manage. "Customer retention is a big part of what gives leasing such appeal for manufacturers, but I think we overlook the certainty it provides." A form of automobile financing that virtually disappeared under the global economic collapse is returning to popularity in Canada. The apparent hibernation of leasing had nothing to do with customer preferences and everything to do with a tight money supply and crumbling residual values of the vehicles. "As credit conditions have improved in recent years, leasing has started to revive," said Carlos Gomes, senior economist and auto industry specialist at Scotiabank. "The auto industry loves it because the consumer is back in three to four years. The consumer is happy because of the lower monthly payments than in an outright purchase." The monthly payment drives the industry, and as leasing disappeared, other alternatives, such as 72-, 84- and even 96-month loans came into the market. But while such long-term loans drove down payments and helped push cars out the door, they introduced their own problems, said Glen Demetrioff, president of DMT Development Systems Group Inc., which supplies integrated IT solutions to manufacturers and automotive clients in 30 countries. "For the long-term finance options, there are a lot of dangers to the industry," he said. "You're off warranty, you have a long term and negative equity; all those are very hard for a dealer and a manufacturer to convert to a buyer." Demetrioff, whose company tracks and forwards consumers' online preferences to automakers, said the return of leasing is customer-driven, a point echoed by Steve Milette, director of sales for Hyundai Auto Canada. As well, Milette said with leasing options that make sense for both the customer and carmaker, there are benefits that flow both ways, starting with reduced costs for consumers. "Customer retention is a big part of what gives leasing such appeal for manufacturers, but I think we overlook the certainty it provides," Milette said. "With a finance or cash customer, we don't really know when they will be back in the market. They could keep their cars for seven years or more. "But with a lease, we know that customer will be back in the market in three or four years. We can plan for that and entice them to stay in the Hyundai family." The trick is setting residual values carefully; high enough for a low payment, low enough to be close to the vehicle's actual value. At Hyundai, where leasing was previously handled by the banking industry, the introduction of its own finance arm - Hyundai Capital Canada - in early 2015 is allowing the company to put a emphasis on leasing. Milette said customers are trying to maximize the amount of car they can get for $300, $400 or $500 a month, and that is driving the popularity of leasing. "I don't really see that changing in the near future because customers have come to expect it." At Ford, leasing suffered only due to the economic downturn, which stifled demand for cars and hurt resale values of used cars, said Margaret Mellot, spokeswoman for Ford Motor Co. Credit. "Leasing is an important tool, as we believe it results in higher customer loyalty and a quicker trade cycle," she said. "It is one tool for knowing when a customer is likely to be back in the market, so we can promote that loyalty." instance, pegs its leasing business at about half of overall sales. Unlike the rest of the market, Mercedes said its leasing business did not suffer the same downturn. "As a manufacturer and lessor, we advocate shorter terms," said Derrick Halvorsen, vice-president of Mercedes-Benz Financial Services Canada. "Because our position is shorter term is better for the customer, and better for the lessor over the long term." Whether leasing could ever be as popular as it once was, Hyundai's Milette isn't sure. 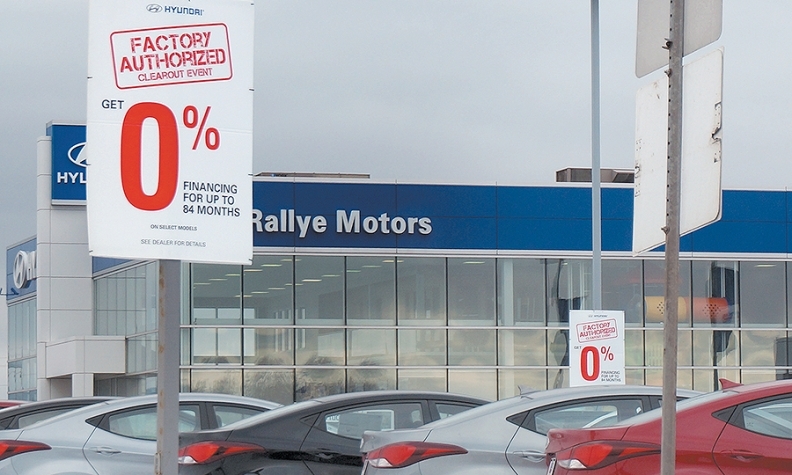 "There will always be a customer that's interested in leasing, much as there will always be customers interested in financing or cutting a cheque to a dealer," he said. "But I think the industry has found itself in a good place with leasing. Right now, it's about 20-25 per cent of the mass market, which most people would agree is a healthy place for leasing." Mellot said it's important to have a balanced approach to offering financial alternatives. "Depending on the individual and the individual's circumstances, a number of considerations could influence whether to lease or to finance," she said. "This is one reason we offer a portfolio of financing options, to have the products customers want at a given time and given their personal circumstances."